Minister of Social Services and Urban Development, the Hon. Frankie Campbell welcomed newly appointed Parliamentary Secretary in the Ministry of Social Services and Urban Development, Mr. Michael Foulkes “into the Social Services family” Wednesday. 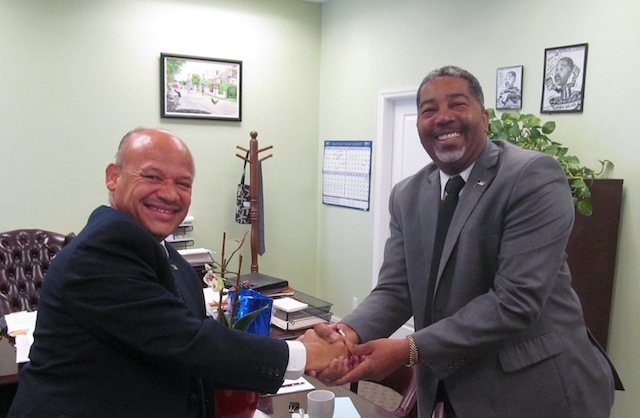 “With those similar characteristics and attributes, I am satisfied that we are going to do well for the people of The Bahamas,” Minister Campbell added. The pair were joined by Permanent Secretary in the Ministry of Social Services and Urban Development, Ms. Sherrylee Smith. Minister Campbell said officials will rely on one of Mr. Foulkes’ many strengths – that of being an Attorney-at-Law -- to help guide and drive the Government of The Bahamas’ commitments to a number of key pieces of legislation as they relate to the Ministry of Social Services and Urban Development, its Departments and Divisions. “We discussed what I believe at this time is the more urgent role that needs to be filled which falls aptly in line with one of the many skills Parliamentary Secretary Foulkes possesses and that is of being an Attorney-at-law to help us with the weaknesses or the non-existence of certain pieces of legislation,” Minister Campbell said. “Without hesitation, primary amongst them are the Regulations to support the Persons with Disabilities Act 2014, and legislation regarding Older Persons and Urban Renewal that need to be addressed. “We also have a number of Conventions that we, as a country, are Signatory to and you would find in many instances that there may be lapses. That is our starting point,” Minister Campbell added. “First of all I want to thank Prime Minister, Dr. the Most Honourable Hubert A. Minnis, for appointing me to this position and for giving me the opportunity to work with such an important Ministry and the various Departments, and to work directly with the honourable Minister, Frankie Campbell, who is making best efforts to improve life for the most challenged persons amongst us, our Brothers and sisters,” Mr. Foulkes said. “I am here to assist as best as I can in this most important function with regard to the legislation, because at the end of the day, that is what it is about for all of us. We are here to deliver for the Bahamian people. By the Grace of God we will all do well,” Parliamentary Secretary Foulkes added.